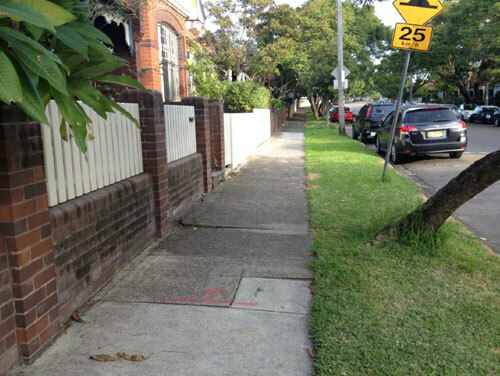 Showing the footpath damage caused by this street tree outside 18 Cardigan Street Stanmore. Photo by Marrickville Council with thanks. Sorry, I do not have a photo of the actual tree. The tree is a Jacaranda (Jacarand mimosifolia) outside 18 Cardigan Street Stanmore. Council’s report says the tree is semi-mature & in good health & condition. Council inspected the tree on 25th July [sic] & recommended that the footpath be removed so tree roots could be inspected. They say that the tree root under the step could be cut & a root barrier installed. The footpath removal was due to happen on 5th June, but Council waited until this Notice of Motion was dealt with in last night’s Council Meeting. Council staff recommended that if the Councillors do vote to remove this tree, then two Jacaranda trees should be planted in its place, as there is room for two trees & to retain the streetscape, which is primarily Jacarandas. This is news to me because until recently newly planted trees were watered twice a week for a period of 12-weeks (3-months). I have never heard of a 12-month establishment period so it looks like street trees will get watered for 12-months giving them a much greater chance of survival. This is good news. As for the tree outside 18 Cardigan Street, I was told that the vote was unanimous to remove this tree because it leaned towards the road & it damaged the property. Vote was Mayor Macri (Ind), Clrs Ellsmore (Grn), Leary (Grn), Phillips (Grn), Tsardoulias (Lab), Gardiner (Lib) & Tyler (Lib). There was a discussion about whether to replace with a Jacaranda or another species. However, the resident did not want a Jacaranda. Council will plant two trees & a verge garden is being considered. A verge garden should be easy to create as it is a grass verge. Let’s hope that the downpipe is connected to the stormwater drain to prevent the next street tree from seeking water & causing a similar issue that results in its removal as well. 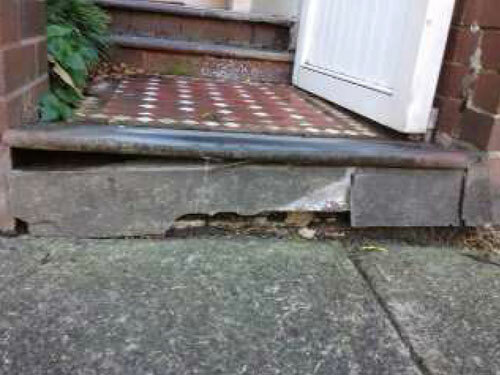 Showing the damage to the step. Photo by Marrickville Council with thanks. 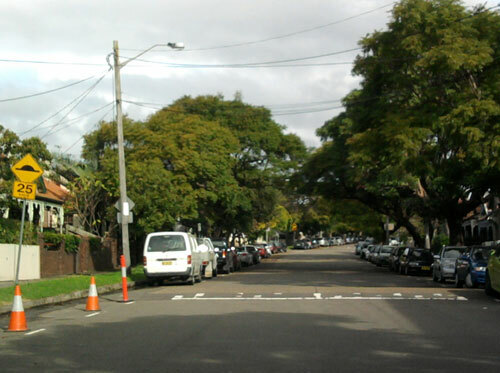 Approval to remove given on Tuesday night – tree removed by Marrickville Council sometime the next day. Photo by poodle with thanks. Here is Cardigan Street. The orange witches hats on the left are where the tree was removed. It is a shame that the streetscape will not be consistent by using Jacarandas as replacement trees, especially as it is such a lovely outlook. Photo by poodle with thanks. without seeing the streetscape, my first reaction is what a shame the resident does not want to replace with 2 jacarandas to complement the other existing trees. however i hope they do agree to TWO trees as recommended as that seems a very generous offer by council! that step though … doesn’t convince me that the tree roots are to blame really, these Federation verandahs were often built on top of building rubble and not stable (hence you see many tessellated tiles cracked and sunken) and poor materials sometimes used – after 100 years it wouldn’t be surprising to see some crumbling occurring b/c poor mortar has eventually failed; that would at least in part contribute to the step damage, even if it is accepted that the roots have also damaged it. the top of the tiled surface seems intact though. i tend to agree with the council report that it would be reasonable to repair. I agree with poodle. The fact that the down pipe was not connected to the storm water system also add to your view. Probably washing some of the soil away and adding to the situation. I do not believe there is much damage to the foot path from the photo provided, no worse than 50% in the municipality. Shame they are not planting two jacarandas and a garden verge. The tree is semi-mature, but the girth of the trunk in that pic doesn’t indicate it has sufficient size to cause infrastructure damage. I am interested in the line “the resident does not want a Jacaranda” . Now I know Jacarandas are contenious trees; you either love their flower display or loathe the mess they make (why you wouldn’t appreciate the purple carpet I’ll never know), but I suspect this may the problem. The resident may dislike cleaning the trees leaves/flowers and thus embellish the claims of damage to have it removed. I don’t know to what extent residents should be given a choice on trees. I do think Council has selected very poorly in the past (bottle brushes which look half dead and stunted are a good example), but on the other hand people may seem to do what they feel fit to trees outside their house. I wish the council would consider the African Tulip Tree (Spathodea). It is compact, everygreen, flowers spectacularly and creates little mess. Native birds love the nectar-filled blooms. i happened to be in Cardigan St yesterday visiting friends and realised i was near number 18. i was quite surprised to see that the tree had already been cut down which seems PDQ if the approval to remove was only given on Tuesday night! the rest of Cardigan St is lovely and lush with tallish trees, mostly jacarandas as previously noted, many with large spreading canopies – it is one of the most attractive streets in the area and i have always admired it. number 18 is quite near to busy Parramatta Rd, so it does seem doubly a shame to not re-plant a similar tree (or preferably TWO!) to retain the harmony of the streetscape and provide some more air filtering of the airborne pollution from Parramatta Rd. i think Adam has a point about differing opinions on jacarandas (!!) or any trees that drop leaves and flowers for that matter. interestingly, council has used a photo of Cardigan Street with the jacarandas in full bloom to illustrate the Tree Survey in this week’s Inner West Courier. obviously they must value the appearance of this particular streetscape, which makes the option of allowing the resident to select a replacement tree other than a jacaranda a bit baffling. 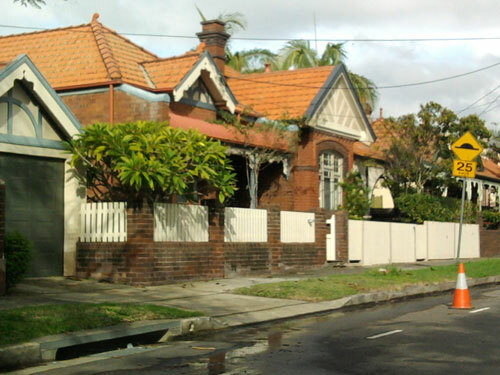 i think there are definitely pros and cons about offering residents the option to choose their own street tree – on one hand, being able to make a personal choice may help the resident to feel more ownership and responsibility to care for the tree long term, but on the other hand it would contribute to a mish mash of trees in a streetscape. i don’t think it is absolutely necessary to plant only one species of trees in any given street, but some sort of harmony in terms of shape, shade, height etc helps create a more cohesive and attractive streetscape. also, people move on …. so the next resident may not appreciate the previous resident’s choice! trees (hopefully!) live longer than the residents, so in the end, a long term tree strategy is more important overall to the environment than an individual’s personal preference. I agree with you 100% poodle. Thanks for taking the trouble.